The story is told with humour and warmth. The text is just a few lines on each page surrounded by the most wonderful art which expand upon the words and flesh out the characters. Ganesha and Mouse are very likeable and Ganesha especially feels like a little child. His eagerness to eat sweets and his delight in drawing feel very familiar! The author's note gives the real version of the story and some help with pronunciation. The art is vibrant and colourful. The palette used is all pinks, yellows, greens and blues. 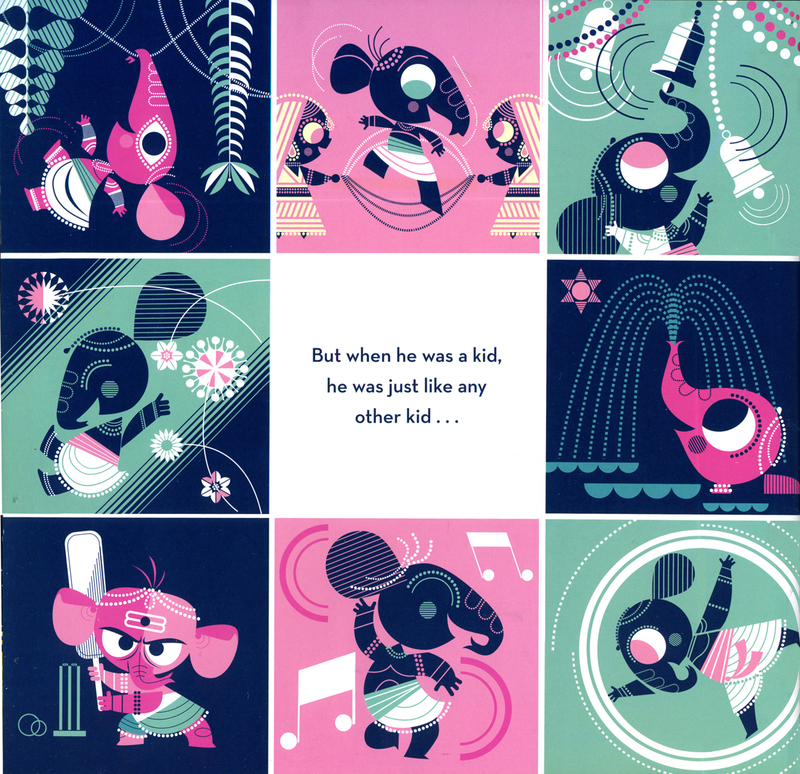 Ganesha and Mouse are drawn as geometric shapes, circles and cylinders, and a lot of the panels have a beautiful symmetry. It feels ordered and carefully arranged to make the pictures and words form a whole. Some picture books feel like the art is an accompaniment, not intrinsic to the story but put in because children's books needs pictures. Not to say that they can't be beautiful, but that in the creative process the words come first and the art second. 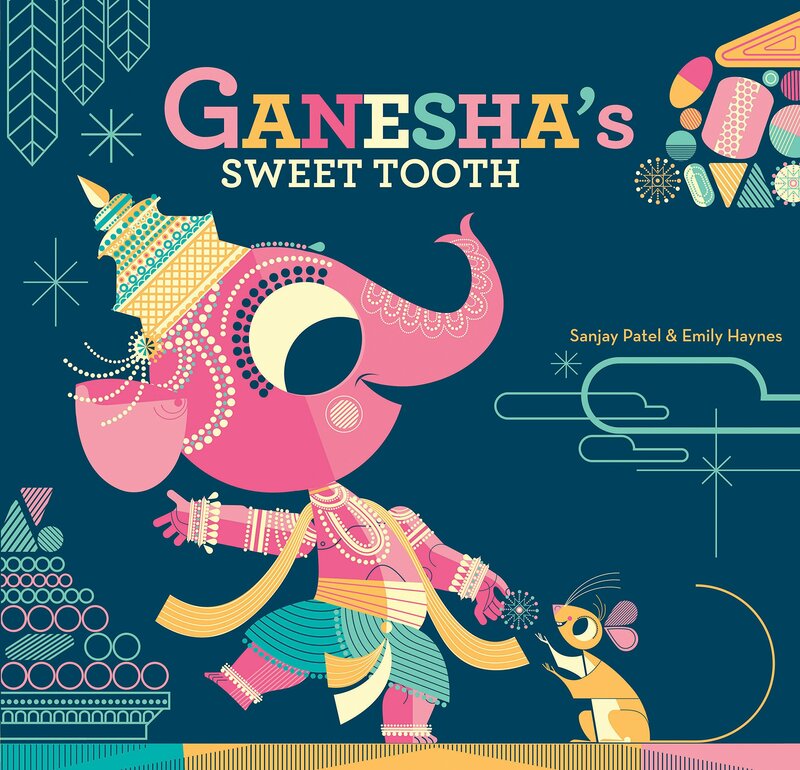 Ganesha's sweet tooth feels like the art and the words have been developed together, hence why I think this qualifies as a comic, even though there are very few panels in the book. Most pages are one picture with a few sentences, which I think works really well for toddlers as they don't have the attention span needed to read a more traditionally laid out comic. Patel worked for Pixar's animation studios on various films including It's a Bug's Life, Ratatouille and the Incredibles.